The attorney general has told shifting stories about his meetings with Russian officials and the firing of James Comey. Last week was supposed to be “infrastructure week” for the flailing Donald Trump administration. And it was, sort of: It was the week that Trump’s opponents built the infrastructure for impeaching him, even if cowardly congressional Republicans don’t acknowledge it yet. Fallout continues from former FBI director James Comey’s testimony before the Senate Intelligence Committee last Thursday. The first casualty may be—or at least ought to be—Attorney General Jeff Sessions, the first sitting senator to back Trump’s renegade candidacy, as well as the architect of Trump’s anti-immigration, anti-voting-rights agenda. On Tuesday afternoon, Sessions will testify before the same committee, and while there were reports that it would be in closed session, pressure from Democrats resulted in his announcing he wanted an open hearing. Since Sessions has ducked two public hearings to discuss the Justice Department’s budget, plus last week’s stormy hearing on FISA reauthorization, as questions about his role in the Russia investigation and Comey’s firing grew, his claim he wanted transparency are as believable as his insistence that he prosecuted black voting-rights activists in the 1980s in order to protect black people. 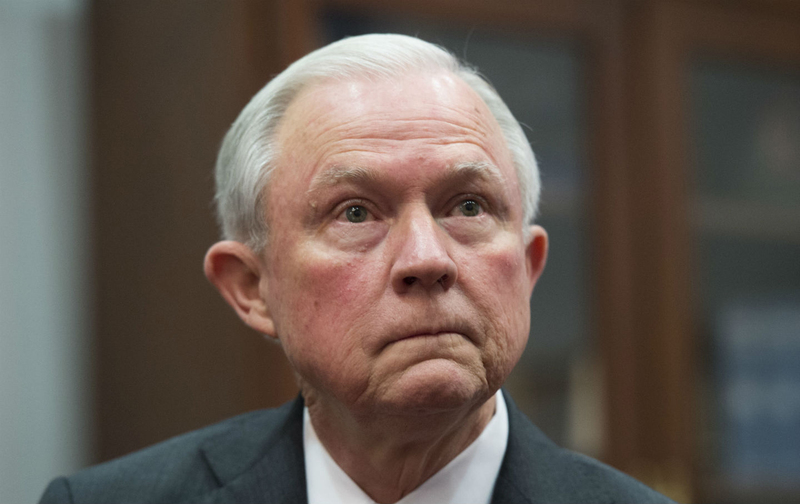 “He has not yet testified before Congress as attorney general, and that is very unusual,” said Christopher Anders, deputy director of the American Civil Liberties Union Washington Legislative Office. Sessions was in trouble before Comey’s testimony last week. We already know that he did not tell the truth to the Senate Judiciary Committee during his January confirmation hearing. He first testified that he’d had no interaction with Russian officials during the 2016 presidential campaign, upon questioning by Senator Al Franken, and then had to admit he had, in fact, met Ambassador Sergey Kislyak on two occasions after The Washington Post revealed it. We also know he failed to list those meetings on his official disclosure forms when Trump nominated him. Although Sessions claimed he didn’t disclose the meetings because he considered them part of his Senate business, not Trump campaign business, he opted to recuse himself from the FBI’s investigation into possible collusion between the Trump team and Russian officials. “That’s a very good question,” Franken told me when I asked him the same thing three weeks ago. He said his colleagues asked Deputy Attorney General Rod Rosenstein that question, when they met in closed session after the Comey firing, “and he said [Sessions] didn’t violate his recusal. I didn’t like his answer.” Franken and Senator Patrick Leahy have written three letters asking the FBI to investigate whether Sessions had perjured himself when he told the Senate he’d never had contact with Russian officials, even though he had; they finally got a response from acting FBI director Andrew McCabe saying he couldn’t “confirm or deny” whether the bureau was investigating that question. That’s progress, of a sort. Look for senators to focus on three troubling questions in the Sessions hearing. First, they’ll grill Sessions about why he participated in Comey’s firing, given his recusal from the investigation Comey was directing. He has tried to insist that the dismissal was due to Comey’s handling of the FBI investigation into Hillary Clinton’s handling of classified material. But Trump himself admitted it was related to “that Russia thing,” in an interview with NBC’s Lester Holt, and Rosenstein told senators that though he wrote the memo criticizing Comey’s handling of Clinton’s e-mail probe, he did so already knowing that Trump intended to fire the FBI director. Either excuse ought to have kept Sessions out of the decision-making. Although his recusal is often reported as having to do with the Russian investigation, it was actually much broader: The attorney general promised to recuse himself from “any existing or future investigations of any matters related in any way to the campaigns for President of the United States,” in his official recusal letter. Even before that, he’d told the Senate Judiciary Committee in January that he’d specifically recuse himself from the Clinton e-mail investigation, since he’d insisted, as a Trump surrogate, that she was guilty of some kind of criminal malfeasance. “I believe the proper thing for me to do would be to recuse myself from any questions involving those kinds of investigations that involve Secretary Clinton,” he said. “This country does not punish its political enemies, but this country ensures that no one is above the law.” So whether you believe Trump’s admission that the firing was about the Russia investigation, or Sessions’s insistence that it was about his handling of the Clinton e-mail investigation, he would seem to have recused himself from matters pertaining to both. Second, they are also likely to ask about reports of a third Sessions meeting with Kislyak, at Washington’s Mayflower Hotel in April 2016, after Trump gave his first big foreign-policy speech. NBC News reported earlier this month that “five current and former U.S. officials” said they knew of classified intelligence regarding a small encounter including Trump, Sessions, son-in-law Jared Kushner, Kislyak, and other diplomats at that Mayflower event, which the Justice Department has denied. Comey seemed to signal there is more we don’t know about Sessions’s role in Trump-Russia relations when he testified last week about facts “that I can’t discuss in an open setting that would make his continued engagement in a Russia-related investigation problematic.” Since Sessions had already admitted two meetings with Kislyak, Comey could have discussed that publicly. Instead, many observers took Comey’s careful words as a reference to the Mayflower meeting, and several news outlets reported that in the closed session, Comey told senators he was indeed referring to classified information about that meeting. Finally, there’s that troubling perjury charge. Democrats on the Senate Judiciary Committee wanted Sessions to return to discuss, in person, the revelation that he’d met with Kislyak, and his belated admission that he’d done so, after testifying otherwise. He did not. Whatever comes of the Mayflower meeting questioning, senators on both sides of the aisle ought to show some interest into why their former colleague had not shared the timing and topics of his discussions with Kislyak at his confirmation hearing in January. That may be where Sessions is headed, absorbing body blows for Trump, shifting attention away from the White House. There’s precedent, by the way, for the impeachment of a cabinet official, too: Secretary of War William W. Belknap was impeached by the House on corruption charges, but resigned; the Senate acquitted him. Republicans show no interest in impeaching anyone, but Democrats might want to bone up on how to impeach an attorney general if Sessions continues to dodge their questions and change his stories.